The Special Ed Advocate is a free online newsletter from Wrightslaw. The newsletter provides accurate, up-to-date information about special education legal and advocacy issues. Our goal is to help readers navigate the confusing world of special education and get quality services for children with disabilities. Mission. The 2017 Archives includes links to all issues of The Special Ed Advocate newsletter and Alerts published this year. To read issues published since April 1998, please visit the Newsletter Archives. January 4, 2017 - ALERT! Educational Benefit: "Merely More Than De Minimis" or "Meaningful"? Supreme Court Revisits FAPE Requirements in Endrew F. v. Douglas Co. Sch. Dist. RE-1 on January 11, 2017. January 10, 2017 - A Guide to Helping Your Child at Home: Developing Foundational Skills in Reading & Writing by Diana Hanbury King. On Sale Now! A Guide: Developing Foundational Skills in Reading & Writing; Too Many Children are Not Learning to Read; Three Generations of Dyslexia at the Supreme Court. January 17, 2017 - 2016 Annual Progress Report...and a Thank You Note. 2016 Progress Report; Top 10 Articles; Top 10 Topics; Top 10 Cases; Top 10 Blog Posts. January 24, 2017 - New! Parent and Teacher Guide to Section 504. Download and Study This New Guide! Parent & Teacher Guide to Section 504; What's Your 504 IQ? Take the Quiz; How Can I File a Section 504 Complaint? ; Video: Section 504 Retaliation Issues. January 31, 2017 - Leveling the Playing Field with Accommodations. Easier Access to Test Accommodations on College Boards; Accommodations & After School Programs; Can the School Deny Accommodations in an AP Course? ; Accommodations in the Classroom and on Tests. February 7, 2017 - W&M Law School Institute of Special Education Advocacy 2017. Registration is OPEN! Get the details and download the application. February 14, 2017 - Saying I "Heart" You to Those Who Help. Learn why and how to say thank you to those who have helped your child succeed. Find tips for avoiding confrontation with members of the team and learn where to find help on the Yellow Pages for Kids site. February 21, 2017 - Can the Use of Restraint Deny Section 504 FAPE? New! OCR Guidance on Legal Limitations on Restraint; OCR Guidance Fact Sheet - Denial of FAPE; How Safe is the School House? ; What Can You Do to Protect Your Child? Sample "No Restraint" Letter. February 28, 2017 - Do I HAVE to Sign the IEP? Do I HAVE to Sign the IEP? ; When a Parent Makes Threats-or Refuses to Sign the IEP; Parent Participation and Consent; IEP Expired! Now What? March 7, 2017 - Hot Topic: Homework Problems, Executive Functioning Issues. Homework Refusal & Failure; Does Your Child Have Organization Problems? ; Tests & Assessments: Executive Functioning Skills; Alternate Placement for "assignment Refusal" - a Helpful Strategy? March 14, 2017 - Can the School Exclude Related Services from the IEP...and Providers from IEP Meetings? School Says No Related Services in the IEP! ; Can the School Exclude Related Service Providers from IEP Meetings? ; Steps to Take When IEP Services are NOT Delivered; IDEA Statute and Regs Define Related Services. March 21, 2017 - Effective IEP Teams: Reality or Impossible Dream? Building Effective IEP Teams; Can We Invite Outside professionals to be Part of the Team? ; Can't Get Your Doctor to the IEP Meeting? ; Friend or Foe? Is My Attorney on My Side? March 28, 2017 - The School Insists We Medicate My Daughter! The School Insists We Medicate My Daughter; Does Medication Make a Child Ineligible for an IEP? ; What the Law Says: 20 USC 1412(a)(25); FAPE May Require a Skilled Nurse. April 4, 2017 - Emergency Evacuation Plans in IEPs, Medical Management Planning. New! Emergency Evacuation Planning for Students with Disabilities; Can We Include a Health Care Plan in My Child's IEP? ; Advocacy Tactics & Strategies; Planning and Preparing; How to Write a Plan to Fit Your Child's Needs. April 11, 2017 - Problems with Field Trip Transportation? Learn How to State Your Case! New! Advocating for Field Trip Bus Transportation; Transportation for After School Activities; Can a Student Receive Special Transportation in a 504 Plan? ; Effective Advocacy: Making Your Case! April 18, 2017 - How Do I File a Complaint? How Do I File a Section 504 Complaint? ; State Complaints Under IDEA; Due Process Complaint Letter; 18 Tips for Filing Complaints. April 25, 2017 - Keeping Students with Disabilities in School, Preventing Suspension. Resource Manual: IDEA Discipline; US DOE: Providing Behavioral Supports; Behavior Problems at Recess? PBIS in the IEP; Functional Behavior Assessments. May 2, 2017 - Got Questions? Ask the Advocates! Can the School Put My Child in a Certificate Program? ; What Rights Do I Have to Choose a School? ; My Child is Making No Reading Progress. What Should I Do? 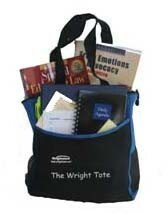 ; Plan to attend a Wrightslaw Special Education Law and Advocacy Training. Register Today! May 9, 2017 - Top 5: Topics - Articles - Blog Posts. What's getting the most attention on Wrightslaw? This issue has links to the five most popular topics, articles, and blog posts in the last six months. May 16, 2017 - Rights of Students with Disabilities in Charter Schools. Rights of Students in Charter Schools; Charter Schools and IEPs; OCR Guidance for Charter Schools; Coming Soon! Wrightslaw: Special Education Legal Developments and Cases 2016; Register for a Wrightslaw Training Today! May 23, 2017 - Know Your Rights: Students with ADHD. Know Your Rights! ; Resource Guide: Students with ADHD; Failure to Identify ADHD & Evaluate Students May Deny FAPE; Special Combo Sale! Wrightslaw: All About Tests & Assessments. May 30, 2017 - The "Norm" for Military Families: Moving, New Schools, Re-Negotiating for Services. Falling Through the Cracks: Military Kids with Special Needs; Legal Issues for Military Families; The Military Child: Law + Resources; SPECIAL COMBO SALE! Wrightslaw: All About Tests & Assessments. June 7, 2017 - Hot Off the Press from Wrightslaw! "Alert!" about the new Wrightslaw publication, Special Education Legal Developments and Cases 2016. The special education landscape is rapidly changing! This unique new book will make it easier to stay up-to-date on new legal developments. Get your copy today in the Wrightslaw Store. June 13, 2017 - Certificate in Special Education Advocacy: William and Mary Law School Institute of Special Education Advocacy ISEA. Conference Details, How to Apply, Download the Application, Get the Agenda. June 20, 2017 - Retention & FAPE: What Does the Research Say? Retention? What's Best for My Child? ; Why Retain if it Didn't Work the First Time? ; Are There any Benefits to Retention? ; Sample Letter: Request the School NOT Retain. June 27, 2017 - Child Struggling to Read - But Falling Further Behind? A reading program needs to be chosen based upon the unique and individual needs of a particular student. In this issue you will learn how to prevent reading failure and the importance of implementing research based reading instruction. You will also find a comprehensive list of resources about how children learn to read. July 11, 2017 - By Using the Yellow Pages for Kids Website you will learn how to find accurate information, resources, and help in your state. Find out how to get a free listing, become a sponsor, and build your team. We hope you will forward this issue to other friends, families, or colleagues. July 18, 2017 - Summer School 2017: Session 1 - Present Levels in the IEP. What's so Important? Present Levels - Where a SMART IEP Begins; IDEA Requirement: Model Form; Don't Let your PLOP Flop! ; Homework Assignment: Reading Checklist. August 1, 2017 - Summer School 2017: Session 2 - Present Levels Checklist. Present Levels are a Critical Part of the IEP; Where Does the Team Get Present Levels Information? ; Wrightslaw: All About IEPs: Present Levels, Measurable Goals, Services; Homework Assignment: Complete the Checklist. August 15, 2017 - Summer School 2017: Session 3 - Present Levels Before Placement. Present Levels-Needs-Goals: What's So Important about this Relationship? ; Parent Involvement in Placement Decision; Changing Placement: Helpful Legal References; Homework Assignment: Create a blueprint for your child's Present Levels. Read the directions, complete your lists, submit the form. August 29, 2017 - Summer School 2017: Session 4 - All Goals Need Present Levels. How Far, By When? ; Evaluations: Include Test Scores in the Present Levels of the IEP; All Goals Need Present Levels; Your Certificate for Summer School 2017. Summer School for Parents, Sessions 1 - 4. September 8, 2017 - Education Rights of Students Displaced by Hurricane Harvey. Unique Challenges in Texas: Education Rights of Homeless Children; Wrightslaw Training in Houston, Texas is still on! ; McKinney-Vento Homeless Education Assistance Act; Educating Homeless Children: Information & Resources; Ensuring the Rights of Highly Mobile and Homeless Children. September 12, 2017 - Strategies and Tips for a Successful School Year. Parent-Teacher Team Building; Tips for a Successful School Year; Protecting Parent-School Relationships; Back to School Checklist - Download in PDF / Spanish. September 19, 2017 - Do's and Don'ts of Parent Advocacy. Parent Advocacy: What You Should Do...and Not Do; Student Success: Set High Expectations; Mistakes Parents Make; Back to School Survival Guide. September 26, 2017 - Your Parent Rights & Responsibilities Under IDEA 2004. Know Your Parent Rights; The Art of Persuasion - Advocacy Style; What the Law Says; Quiz: Get Up to Speed on Special Education Legal & Assessment Terms. October 3, 2017 - Meeting the Challenge of the IEP Process: Want a Good IEP? Write it Wright! What You Need to Know about IEPs; IDEA Requirements for IEP Content; Questions about IEPs? Find the Answers in Wrightslaw: All About IEPs; Tips and Tricks for Getting Effective IEPs. October 10, 2017 - Meeting the Challenge of the IEP Process: Who's on the Team? Who's on the Team? ; New Article! Educational Audiologist on the IEP Team; IDEA 2004: Individualized Education Program Team; Quiz: Who is NOT a Requited Member of the Team? October 17, 2017 - Meeting the Challenge of the IEP Process: "How-To" Tips for Parent Input. How to Use a Parent IEP Attachment; The Power of Your Written Follow-Up Letter; Parent Input at IEP Meetings; IEP Tips for Parents & Teachers. October 24, 2017 - Meeting the Challenge of the IEP Process: Are These Good IEP Goals? Tactics & Strategies for SMART IEPs; Appropriate Annual IEP Goals; "Driver's Manual" for Best Possible IEP Outcomes; SMART IEPs for Behavior Problems. October 31, 2017 - Individualized Instruction: Who is Responsible for Providing FAPE? Legal Concept of FAPE: Individualized Instruction; Endrew F. - Progress, Growth, & Full Integration; What the Law Requires; SCOTUS Clarifies Educational Benefit. November 7, 2017 - Military Kids - They're Just Amazing! Military Family Appreciation Month. Military and DoD Special Education; DoD Special Needs Parent toolkit; Transition and Transferring Schools; Military Discount & Free Shipping in the Wrightslaw Store. November 14, 2017 - Alert! Wrightslaw: All About Tests and Assessments, Second Edition. Now available in the Wrightslaw Store. November 21, 2017 - Special Education Topics: Quick Picks. 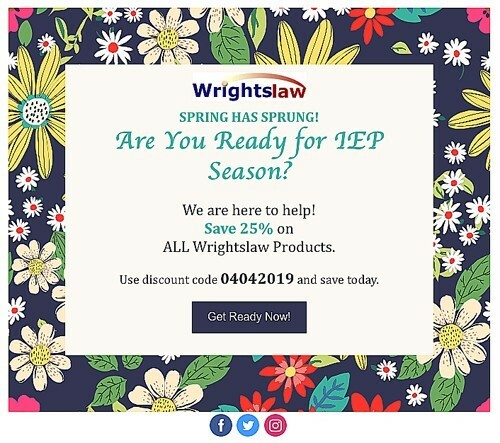 Managing Your Child's Documents; Editor's Choice: Assistive Technology; Allergies and Anaphylaxis; Wrightslaw: Special Education law & Advocacy Training. November 28, 2017 - Tutoring as a Direct Service under IDEA. Tutoring as a Direct Service under IDEA; Homebound Services: 2 Hours/Week=FAPE? ; Gatekeepers! Their Job is to Say "No! "; IDEA 2004: FAPE Defined. December 5, 2017 - Transition to College. College Accommodations: What are my Child's Right? ; College & Continuing Education; OSEP Guidance on Secondary Transition; Legal Requirements for Transition. December 12, 2017 - College & Continuing Education: Good Choices for Kids with LD. Considerations for Senior Years: 504 or IEP? ; Quick Guide to Accommodations on College Boards; Comparing Schools: What's Right for You? ; Transition to Life After School. December 19, 2017 - College & Continuing Education: Finding Financial Aid. Tips & Strategies for Paying for College; "I Can't Afford College" and Other Financial Myths; Protecting Students with Disabilities in Post-Secondary Education; Self-Advocacy: Success Stories.